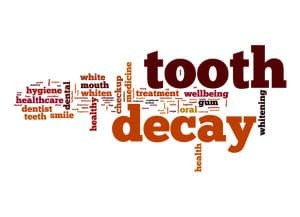 Tooth decay is a common occurrence in children and adults alike. Improper hygiene techniques, and lack of preventive care are main contributors to the necessity of restorative treatments and further dental work. Decay is often painless and can go unnoticed for quite some time. In many cases, it is only detected by X-ray, which is why it is always important to follow your dentist’s recommendations for preventive visits, as this will greatly reduce your chances of developing cavities. Everyone knows that sugar is bad for your teeth; but do you know how it affects them? When you eat sugar-laden foods, naturally occurring bacteria in your mouth metabolize leftover food particles, and produce harmful acids. Plaque is full of bacteria and acid, and as it sticks to your teeth, your enamel becomes a victim of erosion. Once a hole begins to form, it is known as a cavity, and your dentist will likely recommend filling it. In the beginning stages of tooth decay, you may notice a small white spot on your tooth that previously had not been there. This is a sign that minerals have been lost in that area, and must be replenished or the decay will quickly worsen. Replenishing minerals, also known as remineralization, occurs through the daily use of fluoride toothpaste, eating a mouth healthy diet, and maintaining excellent oral care regimens. If steps are not taken immediately to counteract this loss of minerals, your tooth will be at risk for severe decay that may require restorative treatments. Avoiding tooth decay is possible, albeit difficult in some cases. At-home preventive care must be strictly followed, and regularly scrutinized for areas of improvement. Many people find it helpful to purchase an electric toothbrush, which will help ensure that enough time is spent brushing during each hygiene session. Also, always remember to floss at least once a day to remove plaque and food particles from hard to reach spaces.